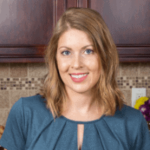 Published: Dec 18, 2017 · Modified: Apr 11, 2019 · By Jen Sobjack · This post may contain affiliate links. 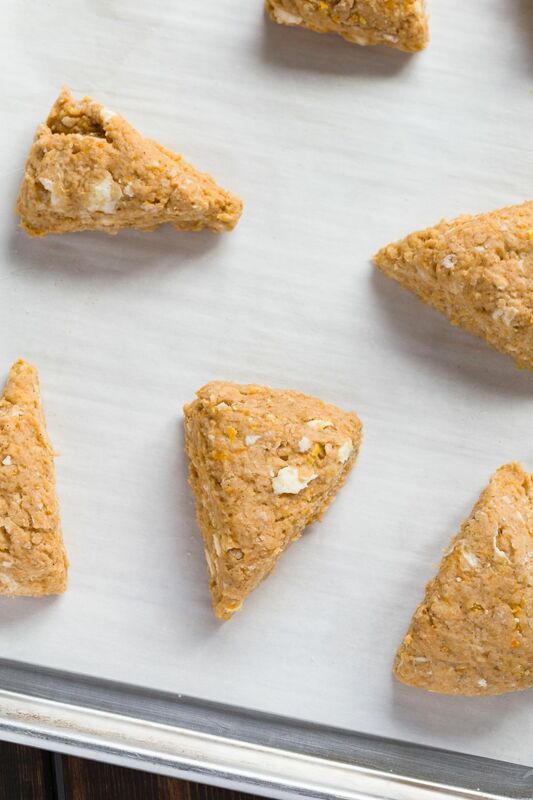 Tender, flaky Honey Citrus Sweet Potato Scones are a delicious way to enjoy breakfast. Loaded with brown sugar, cinnamon, and citrus zest, these are the best you’ll ever try! 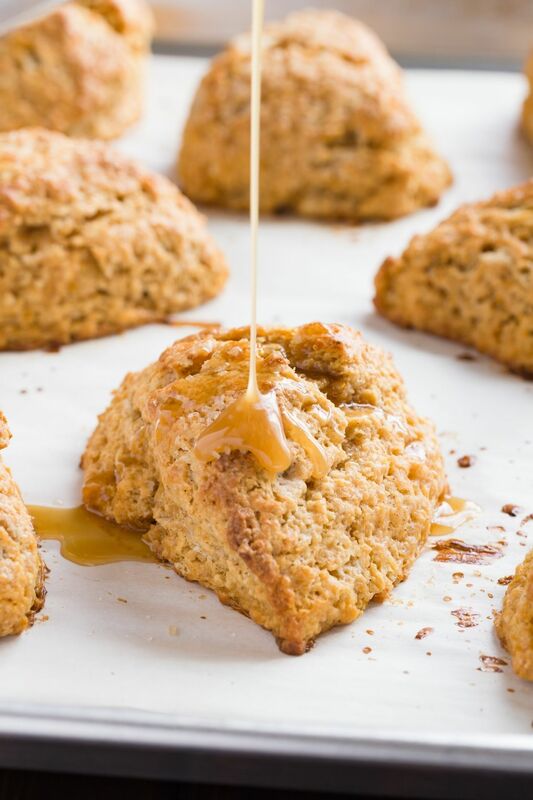 And the honey glaze makes these scones extra tasty. Did you do anything great this weekend? I spent my weekend baking away in the kitchen. 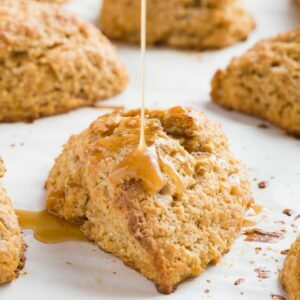 I was determined to create pumpkin scones and another sweet potato scone recipe that was more delicious than my sweet potato scones with brown sugar glaze. I made only a few adjustments to the recipe and ended up with an incredible flavor profile. 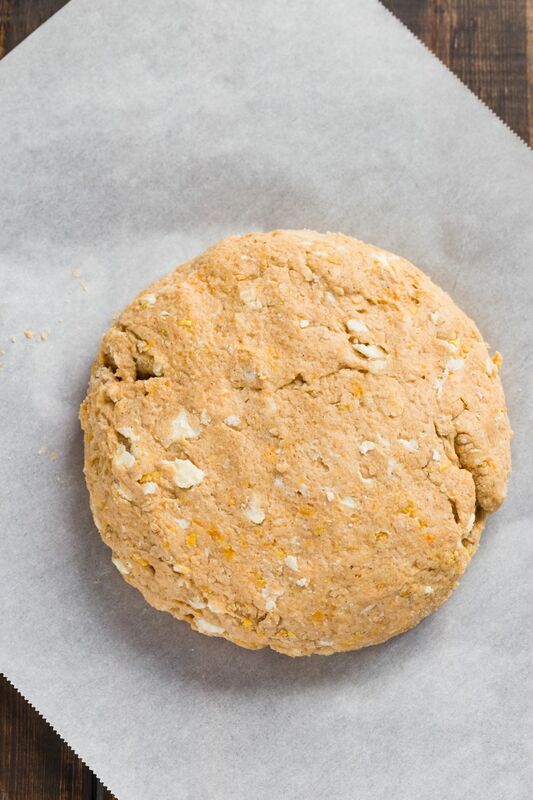 These honey citrus sweet potato scones are so moist, soft, flaky, and full of flavor. In my opinion, they are pure perfection. It’s often a challenge to add puree to a scone base and have the texture turn out just right. But I’m so happy with these results. I can’t wait for you to try them! First, roast the sweet potato in the oven instead of boiling it. This enhances the natural sugars in the potato making it extra sweet. I wrapped mine in foil and let it cook for 2 hours in a 400°F oven. I used a rather large potato so adjust the cooking time depending on the size of your potato. When grating your fresh orange and lemon zest be sure not to grate down to the white skin of the fruit. You only want the colored portion of the rind. The white part is bitter and will give your scones a bitter taste. The next tip and this one is really important, is to not over mix the dough. The dough should be rough; so don’t strive for a smooth dough. This was the mistake I made so many times when I first started making scones. Also, because we are using cold butter, you want it to stay cold, so work quickly. You want to handle the dough as little as possible since the warmth of your hands will warm the butter. This plays into the tip above. The less you mix, the colder the butter, the flakier the product. I shaped the dough in a circle and then sliced it like a pizza. When shaping the dough, gently pat it into a 7-inch round disc instead of rolling it. Then, cut the disc into 8 equal sized wedges. Arrange the wedges on a baking sheet lined with parchment paper or a silicone mat and pop the entire thing into the freezer for 30 minutes. This is a trick I learned about a year ago and it helps to ensure the scone dough is super cold before going into the oven. Brush the tops with heavy cream just before baking so they’ll bake up gorgeously golden brown. For added deliciousness, I made a syrupy glaze with honey, brown sugar, and butter. Melt it all together in a saucepan and pour it over the baked scones. You definitely don’t want to skip the glaze. It goes so well with the citrus sweet potato combo. 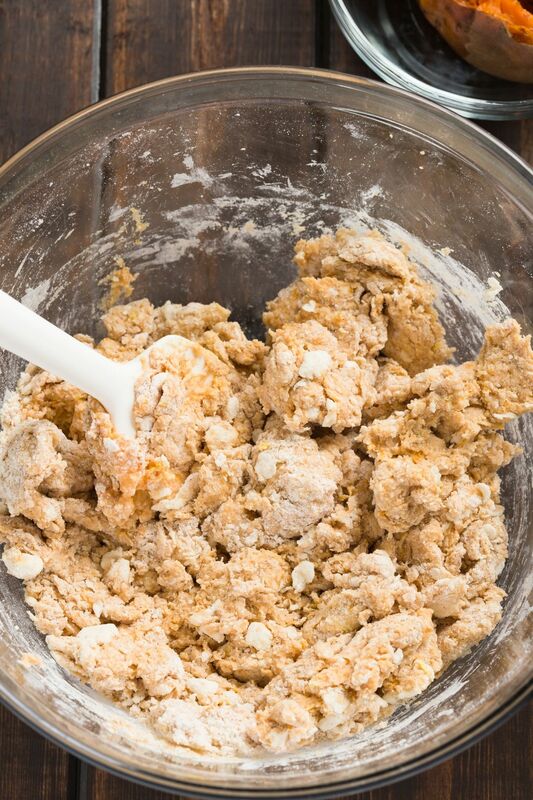 In a large bowl, combine the flour, sugar, orange zest, lemon zest, baking powder, baking soda, cinnamon, and salt. Stir with a whisk to combine. 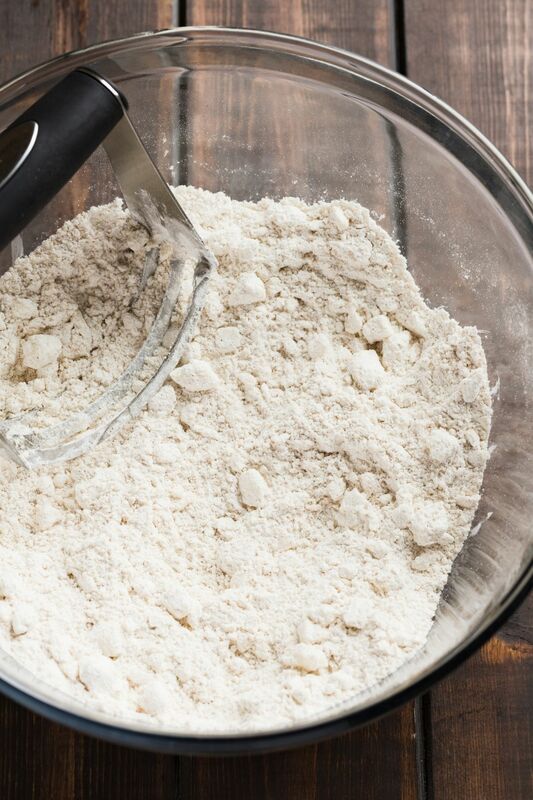 Using a pastry cutter, fork, or two knives, blend the butter into the flour mixture until it resembles pea-sized crumbs. 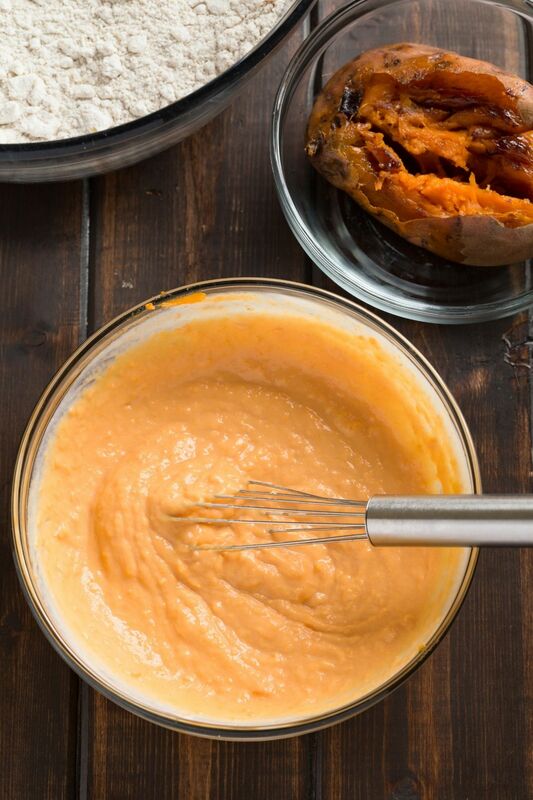 In a small bowl or measuring cup, whisk the buttermilk, sweet potato, and vanilla together, then add it to the flour mixture. Stir just until the dough comes together, taking care not to over mix. Turn the dough out onto a lightly floured work surface and knead it gently about 5 times. Shape the dough into a 7-inch round disk. Cut the dough into 8 equal sized wedges. 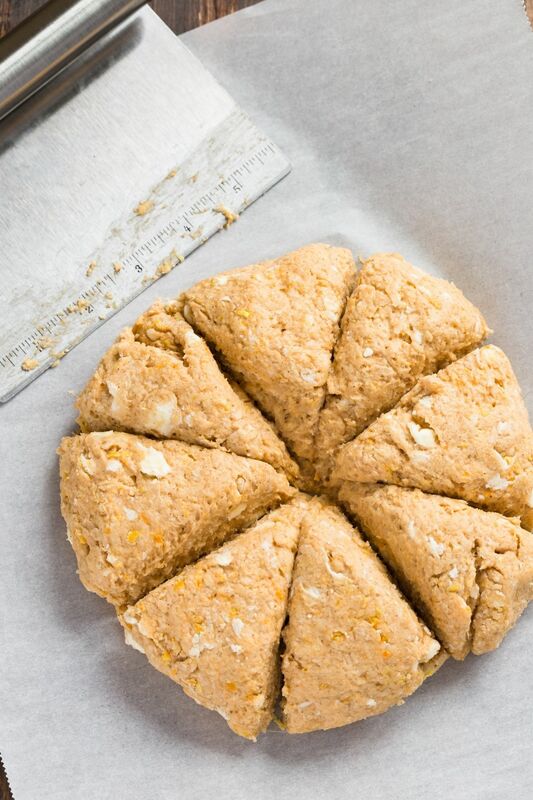 Arrange the scones 2 inches apart on a baking sheet lined with parchment paper. 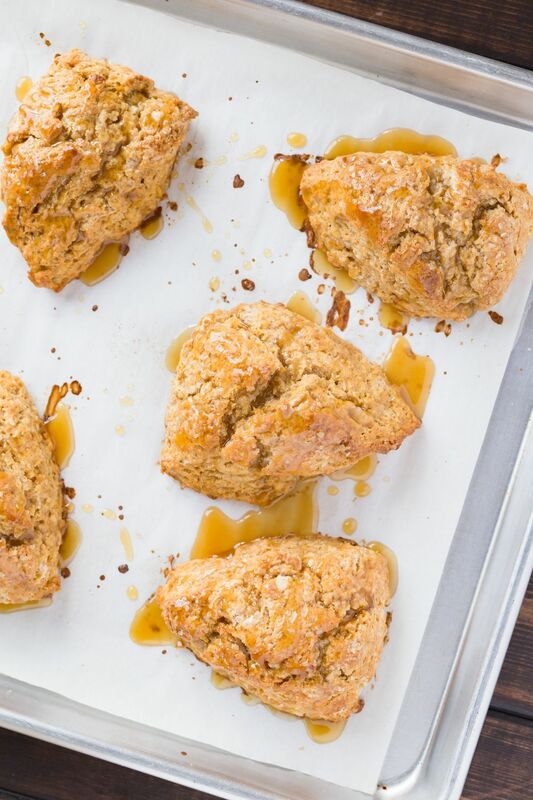 Place the scones in the freezer for 30 minutes. Meanwhile, preheat the oven to 400°F. Brush the tops of the scones with cream. Bake for 15 to 20 minutes or until golden brown. Transfer to a wire rack to cool then drizzle with glaze. Scones are best enjoyed right away. Combine the honey, brown sugar, and butter in a small saucepan. Cook over medium-low heat, stirring often, until the sugar melts and the mixture becomes smooth.